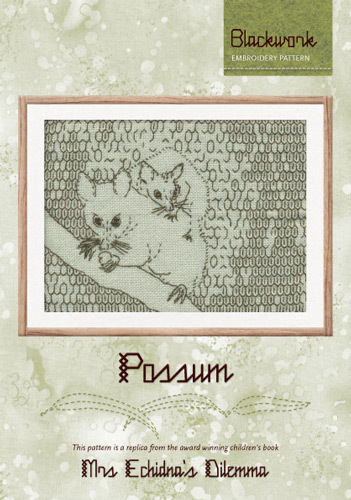 "Possum Pattern - Blackwork" is a replica of one of the illustrations in the book. This particular embroidery is completed in blackwork embroidery, which is rather like sketching in needle and thread. It is stiched on even weave fabric, using repeated patterns to create the design. This pattern would be a great introduction to blackwork for someone who has done some cross-stitch embroidery, and would like to explore the techniques of blackwork.